Marie Prater Goble, 99 of Prestonsburg, KY, passed away April 10, 2019 at Riverview Health Care Center, Prestonsburg, KY. Born January 9, 1920 in Floyd Co. KY, she was the daughter of the late James & Ella May Prater. She is survived by her husband, James E. Goble. Marie was a homemaker and a member of the 1st Presbyterian Church, Prestonsburg, KY. In addition to her husband, Marie is survived by her Children: Lynn Goble (Cliff) Schornak of Navarre, FL, Lou Goble (Connely) McCray of Prestonsburg, KY and Lana Goble (Vince) Ilari of Prospect, KY and Charles Edward Goble of Henderson, KY; brother & sister: Kenneth Prater of Reynoldsburg, OH and Rose Henry of McDermott, OH; 3 grandchildren & 2 step grandchildren. Along with her parents, Marie was preceded in death by his brothers & sisters: Lawrence Prater, Carl Prater, Ernest Prater, Frank Prater, Garnett Hackworth, Eunice Culver & Janet Copas. Marie will be missed by all that knew and loved her. 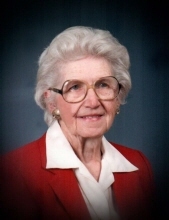 "Email Address" would like to share the life celebration of Marie Prater Goble. Click on the "link" to go to share a favorite memory or leave a condolence message for the family.